Recently my company gave me a laptop to use for work. It was riddled with SpyWare and AdWare. The instant I fired up IE the Virus and SpyWare would trigger up and redirect me to some random ad laden web page requesting me to download even more SpyWare. Since reinstalling the OS was not an option I had to clean up the system on my own somehow. I am listing a bunch of software that you’ll need before we proceed. The first step is to make sure your windows is updated with the latest security patches and fixes. If you are running Windows XP make sure you have installed Service Pack 2. Once you are done installing service pack 2 you should run Windows update and get the latest patches. Another alternative is to use AutoPatcher this is a utility which will download all the required patches and security fixes from Microsoft and store it in a folder on your system which you can later reuse to apply to other computers that you need to update. Run A Full Scan Using AntiVirus and AntiSpyware Softwares. There are a number of free AntiVirus software I have for now listed two of them. Virus can do all sorts of weird things to your computer. 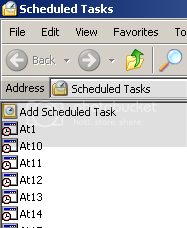 For example on my laptop the virus disabled the “View Hidden Files” option, even though I checked the option it would reset it back, it also set a number of scheduled tasks in my Task Scheduler to call a number of different copies of the Virus. Run a full scan of the system. Next run a Anti-SpyWare software I highly recommend AdAware. Clean Up Your Start Up Items. Most SpyWare and Virus configure your start up items to run the Virus when you boot up or log into your system. Use the MsConfig tool in windows to check which items are being loaded at start up. If you see any suspicious looking entries uncheck them also identify which file is being called and manually delete it. Sometime this might not work like in my case I had to log into widows using safe mode (When Windows is booting up press F8 you will see an option to load windows under safe mode) and delete the offending file. Use the process explorer tool to see if the processing running on your system are all legitimate. Also use AutoRuns to delete any entries that look suspicious especially DLL that are unsigned and have random looking names. Clean Up And Optimise Your System. There are a number of tools that can clean your system of unwanted and unused temporary files and registry entries. One of the best tools that I have found so far is CCleaner which provides a number of advanced options to clean up your system. Try to keep the number of items that start up when you boot the system to a minimum. Better safe than sorry. Ditch IE period and get FireFox. Run an Anti-Virus software and do a full scan periodically. Also do a full Anti-SpyWare scan periodically. Also scan external drives like thumb drives and external hard disk when you connect it to the computer.